Lieutenants Wand and Tumbusch lift glasses at Tavern Night at Navy Hall. All proceeds went to benefit the Friends of Fort George, a most worthy cause. 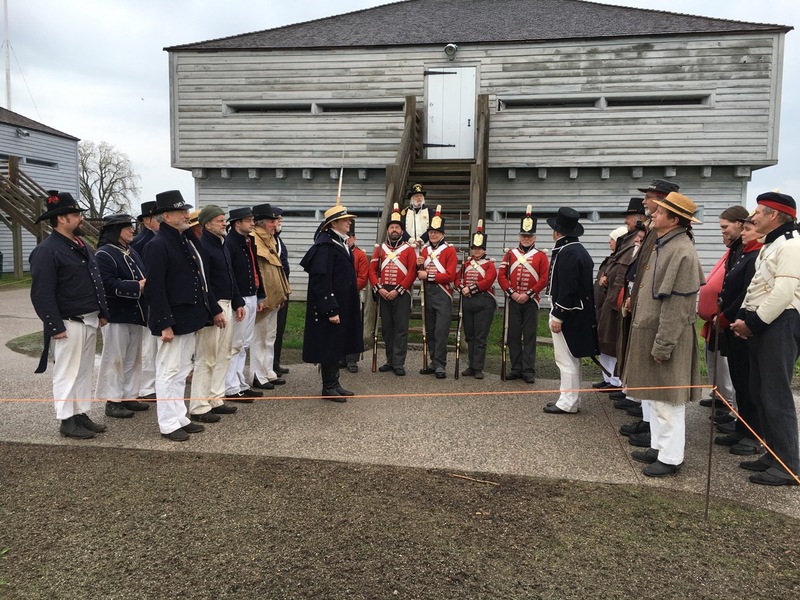 I write to express my sincere thanks for granting me leave to assist in the gunnery training exercises held these three days past at Fort George. Having on many occasions heard you express the opinion that the men of the Royal Navy should more regularly be trained with powder rather than merely running the guns in and out in dumbshow fashion, and having long been in full and complete agreement with you regarding the inestimable value of such training, it is my great pleasure to inform you of the capital and professional manner with which the said exercises were carried out. Briefing session with Lieutenant Commander Reed. I believe I make no idle boast when I say that every man among us, from the saltiest jack tar to the greenest landsman who kissed the gunner's daughter for the first time this Saturday past, shall return to his vessel with new skills and insights that cannot fail to bring honor to his shipmates, his commanding officers, and to His Majesty’s Service. 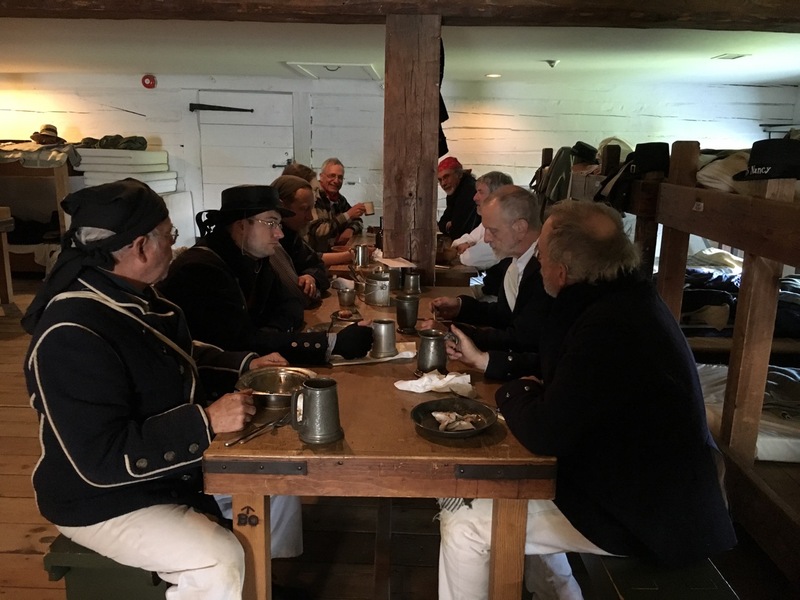 Officers, left to right: Warrant Officer Gurth Pretty (cook and event organizer), Lieutenant William Wand, Lieutenant Commander Andre Reed, Lieutenant Tumbusch, and Sgt. Gregory Renault. I had the honor to serve under the command of Lieutenant and Commander Andre Reed, whose welcoming courtesy, candor, and close attention to the safety and well-being of the men swiftly earned my admiration. I was also much impressed by Acting Lieutenant William Wand, who commanded the port watch (myself being entrusted with the starboard). He is a most amiable gentleman whose experience and skill greatly exceeds my own. We were further assisted by a detachment from the Royal Newfoundland Regiment of Fencibles under the able command of Sergeant Gregory Renault. Dinner in the barracks at Ft. George. we received the full soft bread ration of one pound per man. 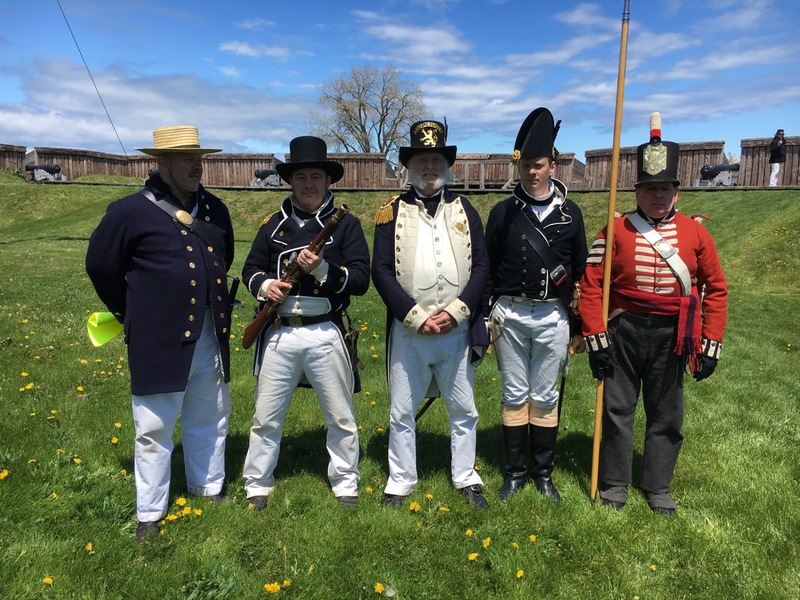 Some 35 men of divers ships were present for training, which included the exercising of great guns, plus hands-on training in the use of swivel guns, railguns, muskets and small arms, as well as pike and cutlass drill. Our artillery exercises concluded with a demonstration for an eager gathering of the local citizenry, where we had the satisfaction of firing a near-simultaneous volley of four guns. I have it on good authority that our public demonstrations throughout the day were observed by some 100 persons, by means of which I hope we may have provided encouragement to future volunteers. The only observation which has given me cause for concern, through no fault whatsoever of any officer here present, is the great and pressing need for Warrant Officer Gurth Pretty, cook for the Royal George, to be speedily assigned a mate, the said post having, in my humble judgment, been vacant overlong. Mr. Pretty's dedication to his duty — not to mention to ensuring that men are well fed to a degree far exceeding the usual custom at sea — are to be commended most highly. I nonetheless fear his great zeal shall presently compel him to overtax his powers and work himself into a state of dangerous exhaustion and fatigue, to the great loss and detriment of his shipmates and His Majesty’s Service, if he is not provided with some relief apace. I should thus be greatly obliged to you, sir, should you be willing convey some similar encouragement unto the Commodore, that the said Mr. Pretty may swiftly have some succor and assistance. While a man with prior experience in cookery would be most preferable, I am in no doubt whatsoever of Mr. Pretty’s ability to train any man with the least bit of wit — even, if need be, one who has been maimed or wounded to the point of being unfit for other service — to perform the said tasks most admirably in short order should no more experienced man presently be available. 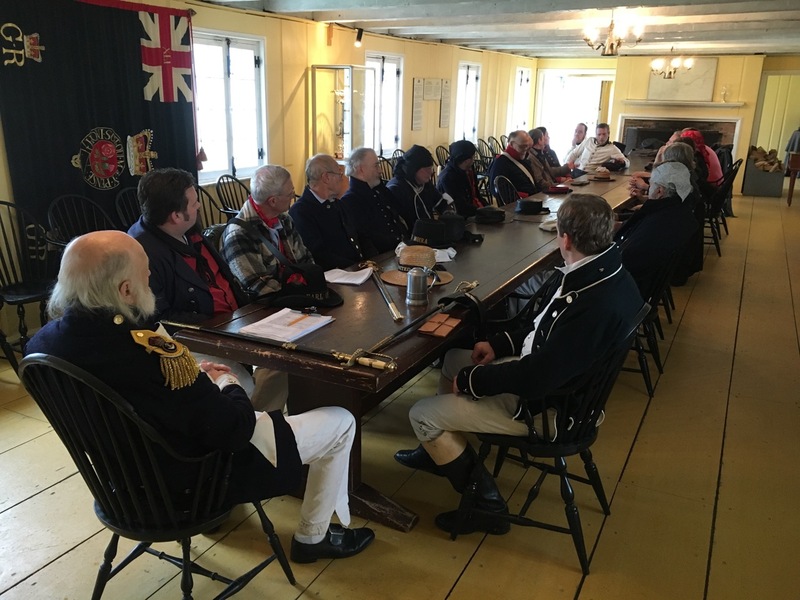 In closing, sir, I should be most remiss if I failed to mention the exceptional hospitality granted to us these past three days by the men of Fort George and their many Friends here in the Town of Niagara. 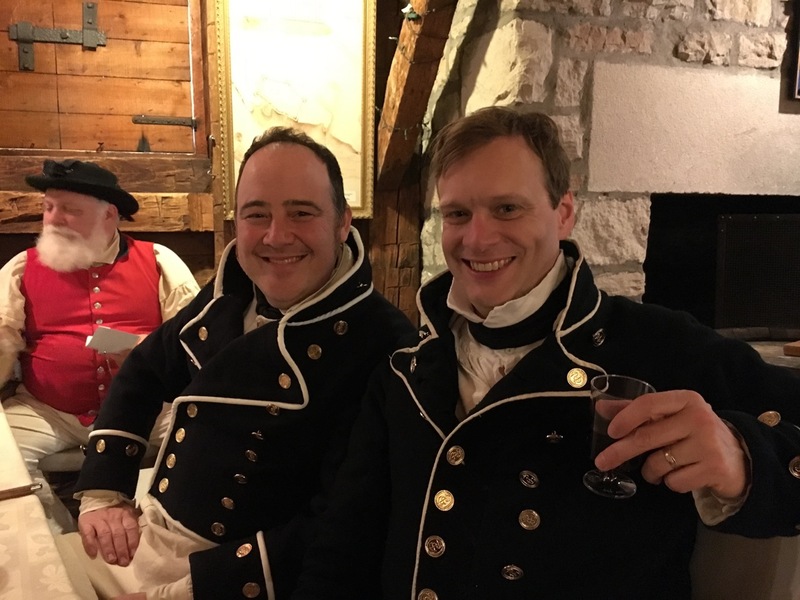 They have made warm quarters and other facilities available to us most generously, refusing any and all remuneration for the same, whilst enlivening our brief leisure hours with fine music, refreshment, camaraderie, and a thousand other kindnesses great and small. 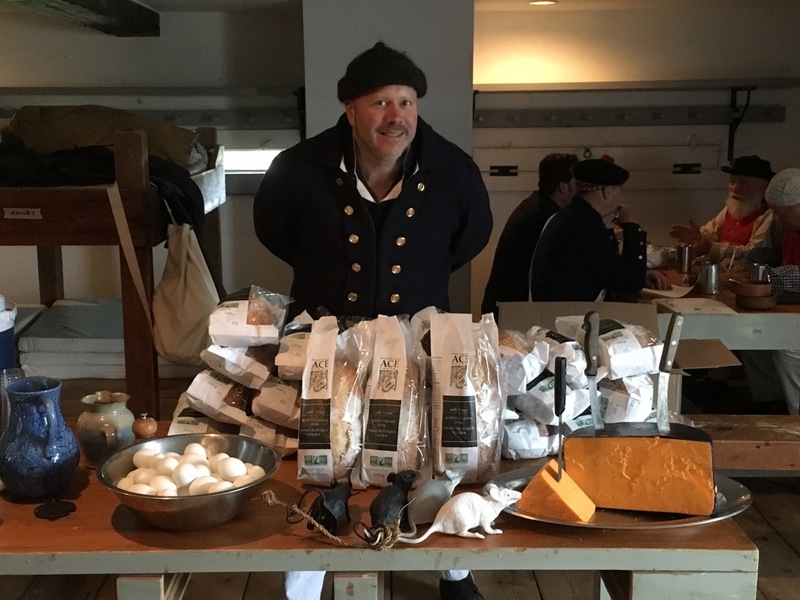 We are further obliged to several victualers, including ACE Bakery, who hath in goodwill donated all of our bread rations; Pine River Cheese & Butter for a most capital old cheddar; and not least to Corby Wine & Spirits and Admiral Suthren, who contributed the rum for our grog. I shall most happily supply you with any further details of these proceedings as shall interest you upon rejoining the Acasta, whence I am bound without delay upon posting this letter via the packet presently at anchor here. Moreover I shall not conceal from you my earnest desire that it may be convenient for a greater number of our men to participate in such exercises in future. It is the Admiralty’s intention to make the said training available on an annual basis, either at Fort George or other divers places associated with His Majesty’s Service, the said enterprise having my wholehearted and enthusiastic support.